Cup stacking (also called sport stacking) is a recognized sport, with competitions and tournaments held all over the world. Players compete to stack cups in specific patterns at top speed. But there are many more fun, physical activities you can try with the humble plastic cup. 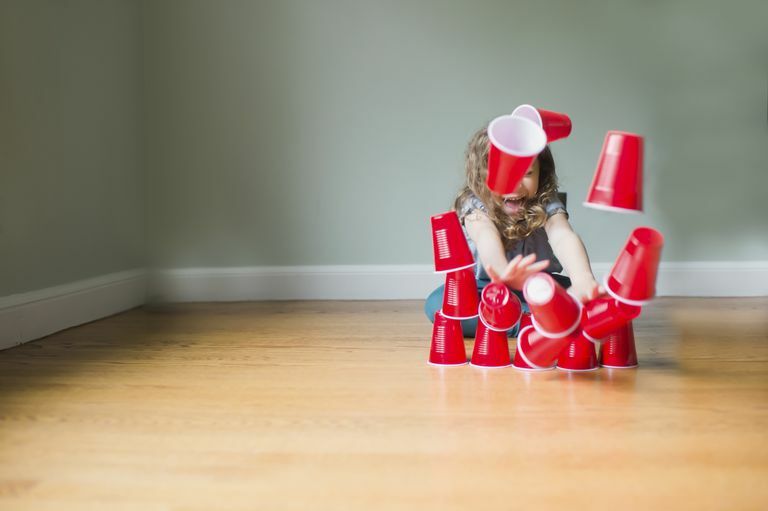 Cups can be piled in pyramids of all sizes and shapes or made into walls or towers. You're just limited by the number of cups in your stash. Luckily, they're cheap (and quite often recyclable). Plus kids are practicing math if they count their stacks or create patterns with different colored cups. Set up a mini bowling alley by using overturned plastic cups as pins. Use the traditional triangle setup or create a stacked pyramid. Then roll a tennis ball to knock them down. Plastic cups make excellent targets for Nerf darts or other kid-safe projectiles. Sarah at Frugal Fun for Boys shows a simple target setup made with PVC pipe, plastic cups, and string. Having the cups dangle from the pipe makes hitting them trickier! You can also tape your cups to the edge of a table, and then race to roll balls along the table and into the cup. The challenge: Roll the balls using only your breath, by blowing through a paper towel roll or aiming a deflating balloon toward your ball. Compete to see who can fill up his or her cup first. Poke a hole near the edge of the bottom of a few cups, then thread a piece of string through each hole. Suspend the strings horizontally. Then you can race to propel the cups along the string using a water squirter. This is an easy group game that involves lots of running around. You need two teams—the Up team and the Down team. Scatter as many cups as you can around a playing area, with half facing up and half down. At "Go," teams race to flip cups over to their designated direction. When you call "Stop," whichever team has the most cups pointing their way wins. Set a cup sideways on the floor and use a kids' golf club and ball to practice putting. Credit goes to Real Simple magazine for this really simple idea: Use a cup and a balloon to create a launcher for pom-poms or mini marshmallows. Cut the bottom off a plastic cup so you have a tube. Replace the bottom with a balloon: Tie the balloon closed, then snip off about a half-inch from the end. Stretch the balloon over one open end of your cup (add a rubber band for extra security). To launch, place your mini pom-pom inside the cup, in the center of the launching pad you created with the balloon. Then pull back on the knot and pow! Release your pom-pom and see how far it flies. Use plastic cups as both throwers and catchers as you volley a ping pong ball or small pom-pom. What's great about this is it works for kids playing alone (toss the ball up in the air, then catch with the same cup), in pairs, or in a small group.